Retired Downers Grove Battalion Chief Bill Friedrich is well known to many area fire departments because of his years of documenting fire apparatus throughout Illinois. In order to remain knowledgeable about new apparatus, Bill keeps track of apparatus that has been ordered by area fire departments and the subsequent deliveries. He has recently shared with us his current compilation which is broken down by truck manufacturer. Although he watches the entire state, we will list here the Northern Illinois rigs whose departments will be listed on this site. The Cicero Fire Department has been added to Division 11. Cicero has 3 stations, runs 3 engines, 2 trucks, 4 contract medic units and has 1 shift commander. 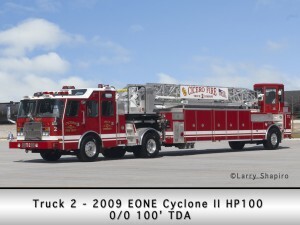 Featured in Station 1 is a 2009 EONE HP100 TDA – the only EONE TDA in Illinois and one of just a few in Northern Illinois. 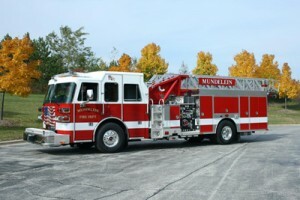 The Mundelein Fire Department in Division 4 has received a new 2010 Sutphen 1500/500 75′ mid-mount quint which runs out of their Station 2. This unit has a full complement of Hurst tools in the front bumper with two reels, a PTO generator and is fully ALS equipped. 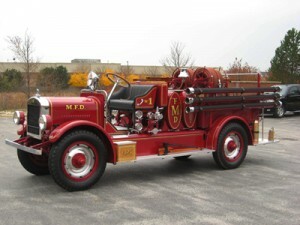 Mundelein also recently completed a full restoration of their 1925 Stoughton pumper. 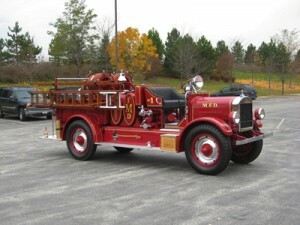 According to Mark Gaunky, this was “fully restored by retired Mundelein Lt. Jim Carew who saved it from being junked. It is a frame up restoration and 75% of the vehicle is original.” The unit has a 350 GPM pump and carries 150 gallons of water. It was originally donated to the village by Cardinal George Mundelein as a thank you for changing the town’s name to the Village of Mundelein. The original purchase price was $7,500 and the cost of the resoration was $65,000. The engine was in service for over twenty years. Another view of the restored Stoughton that was originally purchased for $7,500 and was recently restored for $65,000. 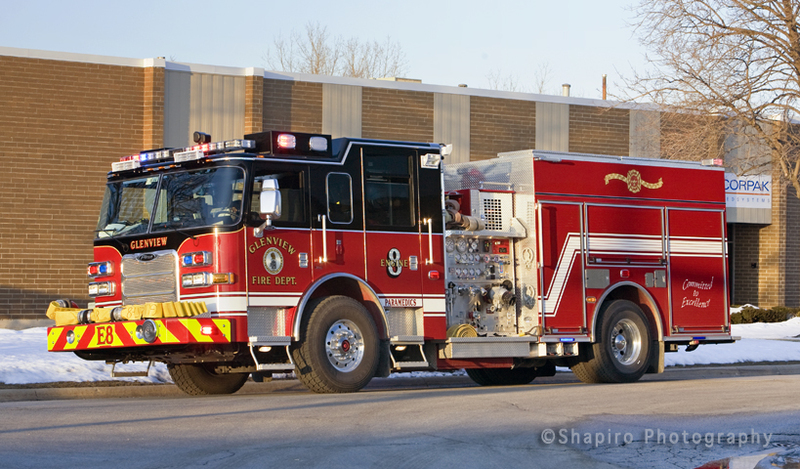 The Buffalo Grove Fire Department in Division 1 and Division 4 has been updated to include the reserve Quint along with updated specifications on several of the other rigs. This quint is scheduled to be traded in when the new apparatus is delivered from Ferrara. There are 12 departments in Division 21. Oak Lawn is the first of these departments to be posted here. They have three stations of which all but three rigs have been posted. Images showing Engine 1, Medic 2 and Medic 5 have not been posted. There is no aerial apparatus featured in these three stations. 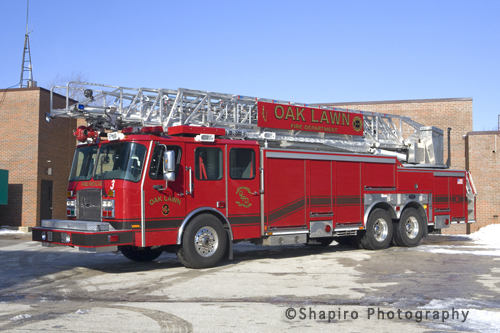 Oak Lawn purchased a 2009 EONE HP100 rear mount aerial that was in service for a matter of months before being taken out of service and put up for sale. 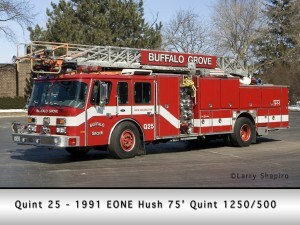 It is believed that an EONE HP78 Quint will be ordered if it has not been already to replace the 100′ ladder. The Quint might see service as a combination unit incorporating the squad company. 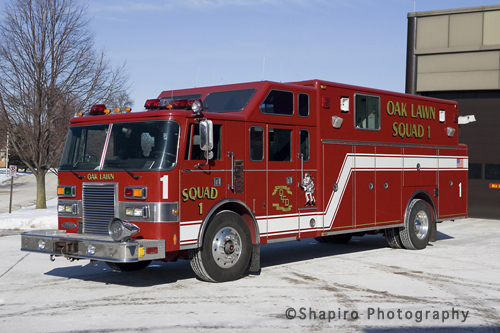 Oak Lawn Squad 1 is currently running with a 2002 EONE Typhoon 1250/500 engine that is reserve engine 5 since they retired a 1991 Pierce Lance heavy rescue. The Glenview Fire Department placed engine 8’s new Pierce into service recently. This is a 2009 Pierce Arrow XT with a 1500 GPM pump and 500 gallons of water. Since this engine went into service, all of Glenview front line units are now Pierce. Engine 8 replaced the last of the various engines with HME chassis. They have one HME/Luverne engine and one HME/Central States engine in reserve. The other engines in service are a 1990 Pierce Lance at Station 13, a 2006 Pierce Enforcer at Station 6, a 2007 Pierce Enforcer at Station 7 and a 2003 Pierce Dash 100′ Quint at Station 14. Here is a delayed post showing the progress on Wheeling’s new Station 24 on Milwaukee Avenue. 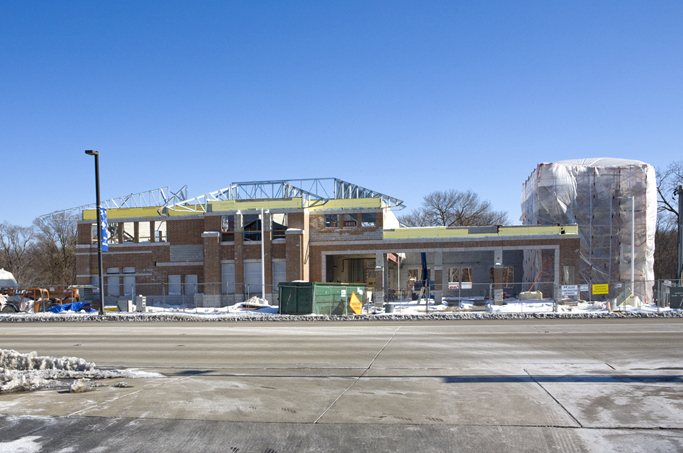 The new station which will become the fire department headquarters is due to open this spring. Originally, plans called for two new stations which would give Wheeling a total of three. This would have allowed them to vacate their current location at 255 W. Dundee Road (Station 24) which also houses fire administration. This facility used to combine the village hall in addition to the police department. The new village hall was completed last year and renovation for the updated and expanded police department has been underway. Budget constraints have halted plans for the third fire station that would have provided coverage to the northwest portions of Wheeling. Subsequently, the fire department will not be able to completely vacate the station on Dundee Road and will have to maintain a company there.